Welcome! Please leave a comment in our Guestbook, please note your comment will only display in the Guestbook once it has been approved. We are creating a new website. Thanks for checking us out. I bought my pup from Patrick when I lived in Naples. So I still consider him a part of this clan. He is a great friend and has accepted a female Basenji rescue. He teaches her everything. He is a large Havanese at 17 lbs. He can jump up to kiss me and I’m 5’5. I have trained him to do all sorts of tricks. He’s never ever in a bad mood and his health has be great. He was born in Sept 2011. This is the first Havanese I’ve owned but it will not be the last. I’d love to put his picture on your site and God willing I will be getting my next pup from this awesome pedigree. His ears are nice and thick. I bought him for personality and his coloring. He was timid at first so I began to take him everywhere I went. In 2013-14 He stayed right next to me during my cancer treatments. Thanks Cindy. He is adorable. 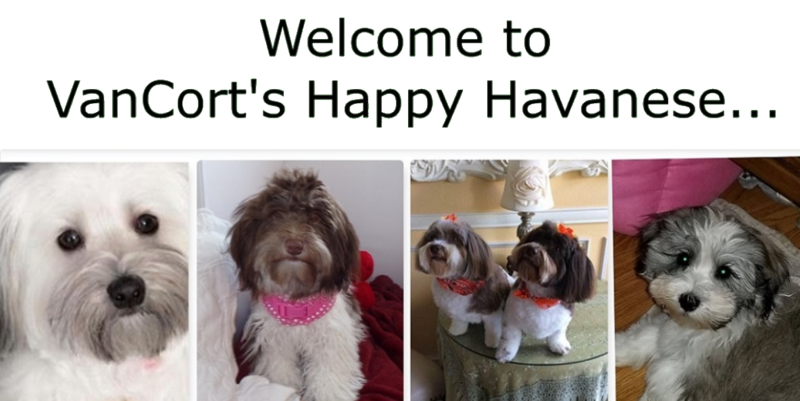 I have chocolate Havanese she will be four shortly. She is the love of my life. A very lovable girl and a true stinker. My girl is very smart and loved by all who comes through my door. Thank you for raising such wonderful pups. Thanks Sharon, We have to agree. They are wonderful.